Bodemeister was one of those horses who put it all on the line. Sometimes, in fact, he seemed just too fast, too bold and too brave for his own good. Going into the 2012 Arkansas Derby as a raw recruit, unraced before January and with just one win to his name, he careered nine and a half lengths clear. Proceeding to the Kentucky Derby, he blasted through the first six furlongs in 1:09.8. Only three previous leaders had ever gone at such a lick - yet he was still able to go clear in the stretch and fend off all bar I'll Have Another. Mike Smith managed a more temperate pace in the Preakness, getting a two-second slack through the first half-mile. But the net result was the same, albeit this time I'll Have Another could not cut him down until the shadow of the post. Bodemeister had become the first horse ever to blow a three-length lead at the eighth pole in both the Derby and the Preakness. Unfortunately there could be no redemption at the Breeders' Cup. In August he was retired with a shoulder injury. How briefly his star had burned, but how brightly! It was the third time in four years that Ahmed Zayat had the Kentucky Derby runner-up. On the other occasion, he had to scratch the likely favourite. It has since turned out, of course, that the Triple Crown gods were just preparing the ground for American Pharoah. 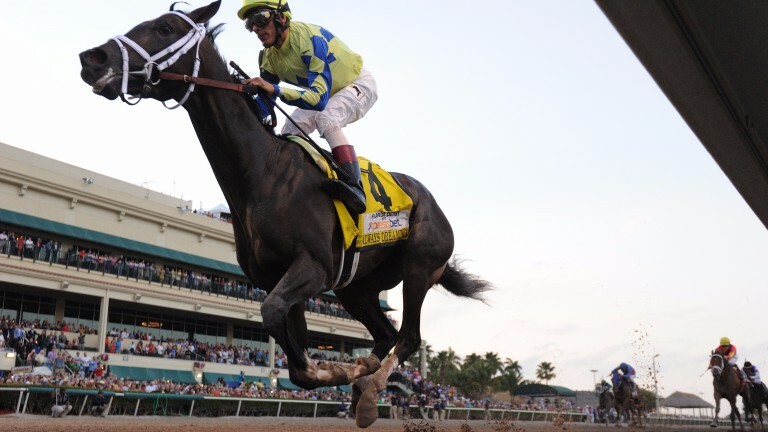 Zayat's 2015 champion is by Pioneerof The Nile, who had begun that streak of near-misses in the 2009 Derby and, like Bodemeister, is a son of Empire Maker. As American Pharoah retired to Ashford, it was announced that his grandsire would himself be returning to Kentucky after a five-year exile in Japan. Empire Maker is now 17 but events at Gulfstream on Saturday mean that Gainesway may soon describe him as more aptly named than ever. For the runaway success of Always Dreaming in the Florida Derby gives Bodemeister a breakthrough colt from his first crop - and consolidates the gains made for their father, as a sire of sires, by Pioneerof The Nile. Bodemeister's stock had been well received at the sales, heading the American freshman averages as yearlings, and 15 individual winners took him into fourth in the national first-crop prizemoney table last year. These included a couple of stakes winners and Royal Copy, who failed only by a neck to take maximum advantage when Classic Empire discarded his jockey in the Grade 1 Hopeful Stakes. But a Kentucky Derby favourite takes the WinStar stallion to another level. Always Dreaming is out of a very brisk mare, Above Perfection, a Grade 3 winner by In Excess who ran champion sprinter Xtra Heat to a neck - the pair miles clear - in the Grade 1 Prioress Stakes as a three-year-old in 2001. She has since made three visits to Fasig-Tipton in November, fetching $610,000 on retiring from the track in 2002 but cashed out at $450,000 when in foal to Dixie Union four years later. The filly she delivered the following spring was Hot Dixie Chick, winner of the Grade 1 Spinaway Stakes. That prompted her owners to send Above Perfection back to the sales, but $1.15 million failed to meet their reserve. She has been given some astute covers since, catching Tapit on the way up to produce a $725,000 yearling and booked into Pioneerof The Nile shortly before American Pharoah embarked on his three-year-old campaign. The resulting filly, now a yearling, will clearly have gained enormously in broodmare value over the weekend. A $350,000 Keeneland September yearling, her big brother had shown ability in two starts for Dominick Schettino last year, third at Belmont and just collared at Saratoga. Switched to Todd Pletcher, he romped by 11 and a half lengths at Tampa Bay in January and then wired an allowance field over nine furlongs at Gulfstream. That prompted Siena Farm and West Point Thoroughbreds both to take a stake in the colt before he returned to course and distance for his Grade 1 debut on Saturday. The new partnership could not have hoped for a better start. Always Dreaming went through the race with a controlled zest and broke away by five lengths once asked to stretch by his rider, who had taken a couple of lingering looks at his rivals turning in. This colt has a wonderfully fluid way of racing and then clicking into overdrive. The way he saw out the race suggests that his pedigree should continue to balance out nicely over the extra distance at Churchill Downs. Because while the tenth furlong proved the undoing of Bodemeister himself, that sooner reflected the wild pace he had set than any deficiency in his stamina. His family tree, after all, is one of copper-bottomed Classic quality, above all in its broodmare stallions. His sire is out of the great El Gran Senor mare Toussaud; his dam Untouched Talent, Grade 1-placed at two, is by Storm Cat out of an A.P. Indy mare. Beyond that there is a well of European staying blood, the next two mares being by Roberto and Nijinsky. A bespoke fit, all in all, for Bodemeister's refined Virginia upbringing on the historic Audley Farm on the banks of the Shenandoah - previous residents including George Washington's ward Nellie Custis, and the Triple Crown winner Sir Barton. Perhaps the most auspicious thing about Always Dreaming is that he echoes the same Unbridled-Caro cross responsible for Unbridled's Song, sire of Arrogate. Bodemeister is by a son of Unbridled, in Empire Maker, out of a mare by Caro’s grandson, In Excess. Curiously it was only last week that Caro's imprint in distaff pedigrees was celebrated here - along with the linchpin status of In Excess in his sire-line, as grandsire of Uncle Mo. The daughter of In Excess who produced Always Dreaming is herself out of an unraced daughter of Somethingfabulous - who earned his place at stud sooner on genes than performance. He was by Northern Dancer out of Somethingroyal, perhaps significantly the dam of two monster broodmare influences in Secretariat and Sir Gaylord. The next dam brings another curio into play as a six-time winner by Terrang, a rugged and popular Californian runner by the imported Hyperion stallion Khaled, sire of Swaps. Terrang sired only a handful of stakes winners and is typical of the way this family recedes largely into hard-knocking old timers. Up until now Bodemeister's most freakish achievement at stud is a colt foaled in Kentucky last year with a white head, from the end of his jaw to just under his ears - described as looking "like he dunked his head into a five-gallon bucket of paint." But now people have another reason to sit up and take notice. At $25,000, after all, Bodemeister is priced to present himself as a more accessible option to his WinStar companion, Pioneerof The Nile, or to Kentucky neighbours American Pharoah and Empire Maker himself. Mind you, he is in a competitive market even among those sires with their first three-year-olds. On Saturday Always Dreaming was chased home by sons of To Honor And Serve and Dialed In, while Pletcher's Rebel Stakes winner Malagacy is a son of Shackleford. Malagacy is trying to break the 135-year curse of Apollo, the solitary Kentucky Derby winner unraced at two. Maybe that was what stopped Bodemeister in his tracks at Churchill Downs, as well. But the very fact that he was able to run such a huge race, when still relatively short of seasoning, shows that he was born to run. And much the same looks to be true of Always Dreaming.